Nguyễn Cao Kỳ Duyên is a Vietnamese-American personality and co-host of Thuy Nga's Paris by Night shows, and is also a law school graduate. Kỳ Duyên was born in Saigon, South Vietnam, and was 10 years old during the Fall of Saigon. Her family was anti-communist and worried that they would be persecuted by the North Vietnamese government if it succeeded in defeating South Vietnam. Her father is a former prime minister, vice president, and general, Nguyen Cao Ky.
Kỳ Duyên currently works as a Master of Ceremonies for Thuy Nga's Paris By Night videos and lives in Orange County, California. She is married to Trinh Hoi, a refugee lawyer and concert promoter. Her father had made arrangements for their political asylum in the United States. She grew up in Fairfax, Virginia, and then the family moved to Huntington Beach. Kỳ Duyên first learned to play the piano at the age of 5-8 years old. At the age of 15-18 she studied music and music theory. She also has two years of voice training. While growing up, Kỳ Duyên had a stint in many professions. In her late teens, she had her own photo studio dedicated to photographing fashion layouts. Through her connections with many of the models, she was often asked to introduce them on various fashion shows in Southern California. In many ways, this was her introduction to the world of show business and being the Master of Ceremonies (MC). Her debut as an MC was at Long Beach's Hoa Hau Ao Dai show. 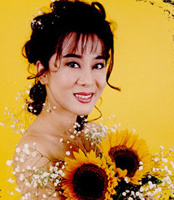 In 1984, she first recorded with Tung Giang Studio. In 1985, she made her first public appearance as a singer in Seattle, Washington, but her first televised performance was in 1993 at the Hollywood Night Video. As suggested by her name, Kỳ Duyên's charm, her command of the one-liners, and her stage presence was noticed by many people in the Vietnamese entertainment industry. Kỳ Duyên became famous through her many appearances in the Thuy Nga Paris videos. She now regularly performs in Las Vegas, California and Paris, France. Kỳ Duyên has demonstrated that she is multi-talented, and she has recently returned to singing. She claims that there are others members of her family with musical talent, but she is the only one who chose to pursue a career in show business. She revealed that as a singer she is inspired by music that moves the heart. As a listener, she enjoys jazz and Vietnamese as well as foreign music. When asked if there was a particular song she was most proud of, Kỳ Duyên responded that "What a Wonderful World" by Louis Armstrong is one of her many favorites because of its positive inspiration. In her spare time, Kỳ Duyên likes to dance, acting, and interior decorating. She also enjoys reading, playing tennis, playing mahjong, and hanging out with friends. Her favorite foods are any kind of "mắm" and "cafe sữa đá". Kỳ Duyên likes to perform in Las Vegas the most, since it's close to home, and she can take her family for a mini-vacation to have fun in the casinos while she works. Her future projects include her first solo CD, taping a video for Thuy Nga, and appearing in concerts almost every weekend in many major cities of the US.